Nic+Zoe tank top in signature Perfect-knit jerseya must-have, year-round layering piece. Approx. length: 17.5"L from shoulder to hem, 18"L down center back. Caroline Rose tank in crepe suzette with matte finish and graceful drape. Scoop neckline. Wide shoulders for bra coverage. Sleeveless. Caroline Rose tank in crepe suzette with matte finish and graceful drape. Scoop neckline. Wide shoulders for bra coverage. Sleeveless. Relaxed silhouette. Side slits. Even hem. Pullover style. Polyester. Hand wash. Made in USA of imported material. Caroline Rose tank in wrinkle-resistant, stretch-knit jersey. Approx. length: 21"L from shoulder to hem, 28"L down center back. Scoop neckline. Caroline Rose tank in wrinkle-resistant, stretch-knit jersey. Approx. length: 21"L from shoulder to hem, 28"L down center back. Scoop neckline. Sleeveless; bra-friendly sleeves. Relaxed fit. Side slits for ease over hip. Pullover style. Polyester/spandex; machine washable. Made in USA of imported material. Cushnie Et Ochs tank with contrast logo elastic at back. Scoop neckline. Sleeveless. Relaxed fit. T-back design. Pullover style. Nylon/spandex. Cushnie Et Ochs tank with contrast logo elastic at back. Scoop neckline. Sleeveless. Relaxed fit. T-back design. Pullover style. Nylon/spandex. Made in USA of imported material. Model's measurements: Height 5'10"/177cm, bust 33"/84cm, waist 25.6"/65.2cm, hips 35.8"/91cm, dress size US 2-4/FR 34-36. 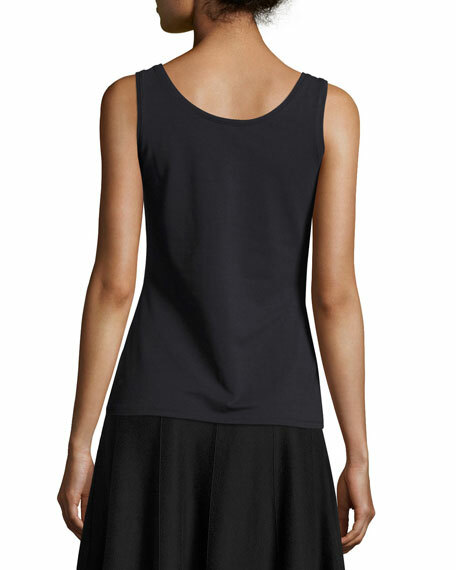 Eileen Fisher lightweight jersey tank, in your choice of color. Approx. 27"L from shoulder to hem. Scoop neckline and back.